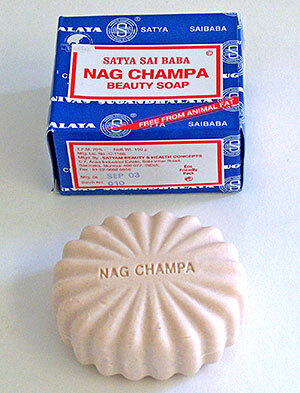 If you like the fragrance of Nag Champa, you'll really enjoy original Satya Sai Baba Nag Champa Beauty Soap. This all natural French milled vegetable soap contains distilled palm oil, distilled rice bran oil, coconut oil, titanium dioxide, sorbitol alkali, preservative,and nag champa perfume. Cruelty-free, it contains no animal products. Its rich lather is a natural deodorant and skin softener. 75 gram bar.